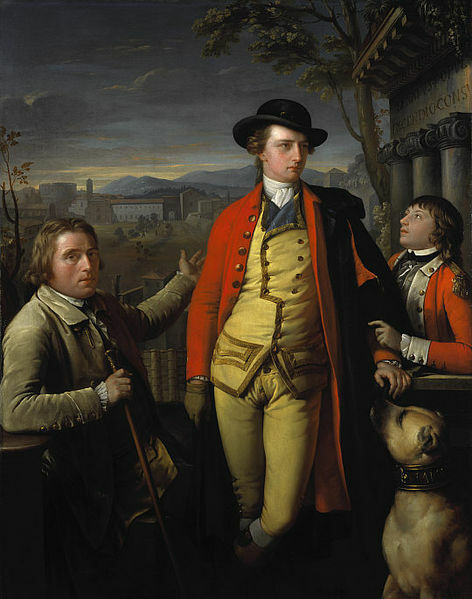 Douglas Douglas-Hamilton, 8th duke of a headache-inducing number of titles– including Duke Hamilton of Scotland, Duke Brandon of England, Duke Chatellerault of France, Marquess of Hamilton, of Clydesdale, of Douglas; Earl of Angus, Arran, and Lanark; Lord Macanshire, Polmont, Abernathey and Aberbrothock of Scotland; Baron Dutton and Hamilton in England . . . Still got your attention? Good. Our handsome devil (more devil than handsome, a certain lady wife might say), whom we shall call Double Douglas just once in this post, lived in a big, lovely house called Hamilton Palace. 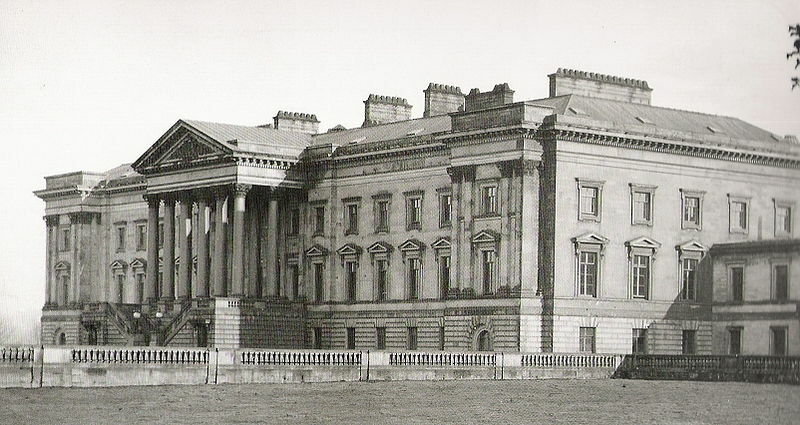 Hamilton Palace, built in 1695, demolished in 1921. **Much of the Hamilton fortune derived from the coal industry. The mining that took part on the property resulted in the property being deemed unsafe. So sad! It once housed priceless art works which in 1882 were sold for £397,562, including a throne from St. Petersburg, floors and doors of black Galway marble, a grand Corinthian portico, and green porphyry columns taken from the Basilica di Semproneo originally from Ancient Rome. More here. He was the second son of the 6th duke who had the keen misfortune of dying from a cold after a hunting expedition. His brother, James, the heir apparent from age two onward, died from consumption–or if we are to trust Dodley’s Annual Register , “his growing so exceedingly fast is said to have been the cause of death”–before reaching the age of 15. The 7th duke was already 5’8 in his early teens which was apparently thought to be a medical condition on account of vertical largess (5’8 or so being the average male height during C18). Having lost her first heir, Hamilton’s mother panicked and shipped the newest duke off to the Continent as he was also known to suffer from a delicate constitution. After four years touring Europe with his tutor, Dr. John Moore, Hamilton returned to England, his vitality restored, his mother happy, and all well and right with his world. The parson’s mousetrap, however, caught up with him. Two years after his homecoming, Hamilton entered into an imprudent match with Elizabeth Anne Burrell, daughter of a Mr. Peter Burrell. This is where the road gets bumpy. Duchess and Duke of Hamilton, a now extinct portrait by Sir Joshua Reynolds, painted 1779, a year after they were married. A sweet portrait; the affection between them is palpable. In the Duchess’s mind, this divorce action had roots in Hamilton’s previous affair with the Earl of Eglinton’s wife, neé Frances Twysden, around 1787. The then 31 year old Hamilton would visit Lady Eglinton at night, including when Lord Eglinton was shortly away at supper. 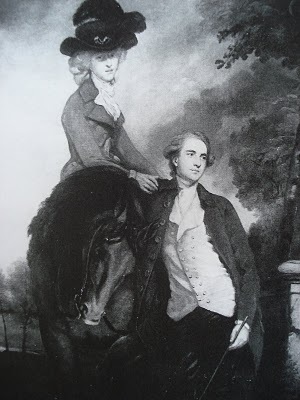 Their congress occurred with such regularity that the Earl’s servant, Montgomery Lawson, was boldly asked by Lady Eglinton, “if he would admit the Duke of Hamilton into her bedchamber”. He refused. She admitted the married duke anyway and so continued her not-so-discreet affair. For another 12 years, Hamilton continued in as much the same manner as he had before his divorce. Despite the duke’s stimulating lifestyle, however, he failed to remarry and died at the age of 43. He did have an illegitimate child with the actress Harriet Pye Bennett (at the time called Mrs. Esten), but never produced issue. The title passed to his father’s youngest brother, Archibald Hamilton, the 5th duke’s eldest living son. Archibald Hamilton, the 9th duke, was only 16 years older than the 8th duke, and unlike dukes 5 through 8 who succumbed to illness before their mid-forties, Archibald managed to overcome what had proven to be a delicate constitution in the exalted line and lived until the ripe age of 79.